Give your customers what they want, every time. Get a 360-degree view of your customer and provide smarter, more personalised customer service. Today, keeping up with customer expectations means delivering a personalised experience for each and every customer. Having a complete 360-degree view of all previous customer interactions, customer information, purchase history, and preferences is the prerequisite for meeting these expectations. Providing the right answer the first time is table stakes. Providing faster, smarter, more personalised service is the way to truly differentiate your company from the competition. 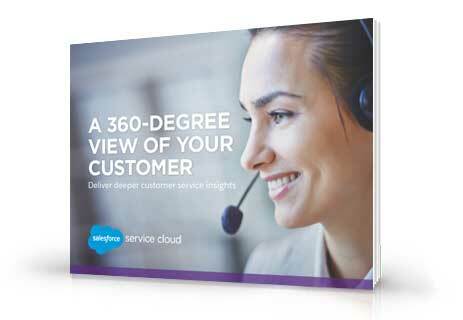 Read the e-book “A 360-Degree View of Your Customer” and learn how Service Cloud from Salesforce can help your company do just that. And in the process you’ll find out why Service Cloud is the world’s #1 customer service app.